Some projects feel like you just need to keep them, even though they are meant for gifts. 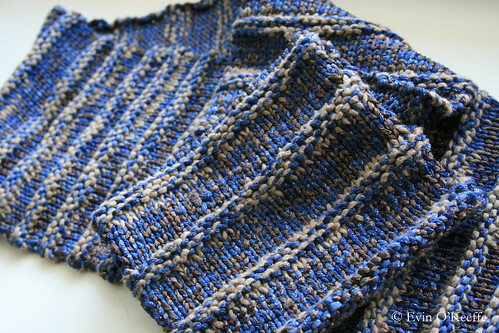 One example of this is the Midnight in Paris Trench Scarf I knit for my sister-in-law in 2009. 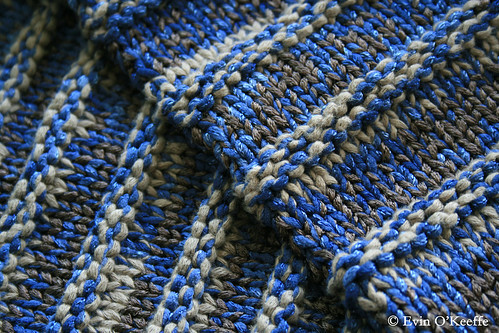 I love how this turned out and it is a soft, cozy, hand-washable scarf. Cast on 30 using two [discontinued Louisa Harding Fauve and Sirdar Duet] yarns together. They’re each a supple cotton-nylon blend that drapes well and has a sturdy feel in the right gauge. I knit the first two rows to prevent the edges rolling. Then I knit in stockinette, slipping the first stitch in each row. Once I would reach the change in hue within the Sirdar yarn (from dark shiny brown to matte taupe). Knit garter stitch at least three or four rows while taupe is present then resume stockinette. 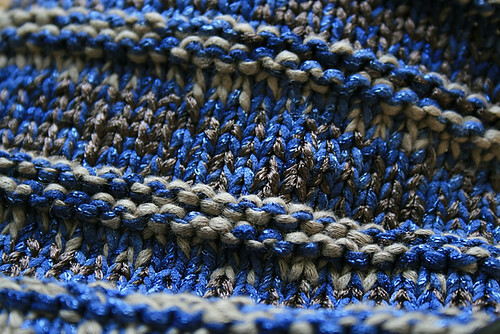 This creates a ribbed texture only when the taupe is present making it more interesting. No counting, just looking for the taupe. Knit back and forth for three rows then return to stockinette. Knit the final two rows of the scarf and bind off. Had a slight issue with an increase, but it’s not too bad and the flaw will help prove it’s handmade since it otherwise is pretty darn beautiful. Very soft and somehow holds shape nicely. The length is ideal for wrapping behind the neck and folding over in front beneath a trench — and the colors are charming when paired with the traditional khaki hue of a classic trench coat or dark brown of a leather coat. In the end, I gave it to my sister-in-law, but I always think of this scarf when I wear my putty-cream pea coat. This entry was posted in Knit Scarves & Cowls, Knitting | Crochet, Tutorials | Patterns and tagged crafts, Knitting, sewing, upcycling. I can see why you wanted to keep it! Beautiful, and lovely, simple pattern. I think I will, Talena. I bought a similarly textured yarn this summer, though it doesn’t have the same color changes, I can just do it every few rows.